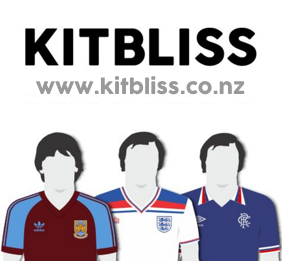 Often in the world of football kit design, the basic, perhaps primitive ideas of yesteryear are dismissed as being too old-fashioned or simplistic. This should never happen, for today's kits have all evolved from those same ground-breaking designs. It's the responsibility of all of us to remember the best of what went before. 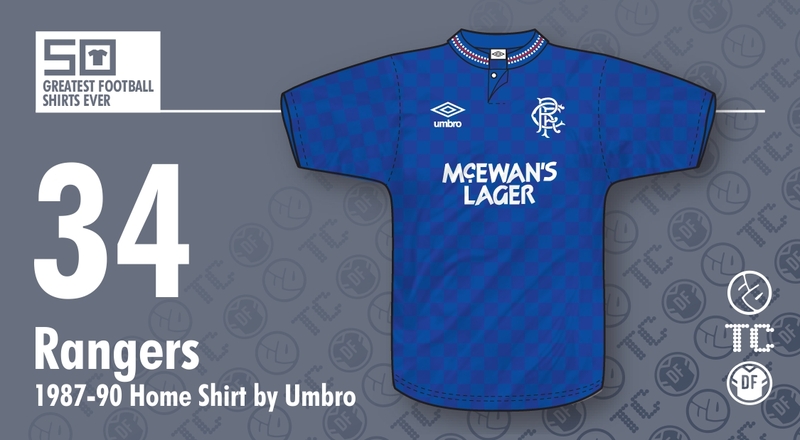 This is certainly true of Rangers' home shirt, worn for the last few years of the 1980's. As had been the case since at least the mid-1970's, Umbro were the manufacturers, but here, at last, their latest design was heading in a new, dynamic direction. In the few years leading up to 1987, the famous blue Rangers shirt had started to look a little tired, relying on a couple of Umbro’s less inspiring templates for any real excitement. Now, they had a beautiful yet simple checker-board shadow pattern with merely a thin strip of white piping to offset it on the shoulders. There was also a new collar - a round neck with button-up fastening as seen on the England home kit of the same era. Again, understated, but beautifully executed. The master stroke, however, lay in that shadow pattern. Subtle enough as to not be a coloured feature in the traditional way, it was noticeable from virtually any angle, almost all of the time. Take a look at any Rangers photograph from the era and you’ll see that repeating pattern of alternately shaded squares. It became the main feature of the shirt despite only being a result of the fabric being weaved in different directions. Other shadow patterns from the late-1980s weren't quite so distinctive; too slight to register on the consciousness of football fans. This one, however, reflected the light perfectly, demanding to be noticed and gaining everyone’s full attention. 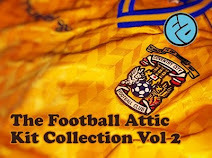 As if to reinforce the quality of the design, a succession of quality players were seen wearing it: Graeme Souness, Jimmy Nicholl, Mark Hateley, Davie Cooper, Terry Butcher, Trevor Francis, Ray Wilkins… If ever a shirt was going to get a huge amount of exposure, this was it, and yet the shirt sold itself effortlessly without their help. In closing, I'm proud to admit that I was the proud owner of a Rangers shirt in my late teens. I wasn't a Rangers supporter, although I did once select the Ibrox club as my favourite Scottish team from those attached to my Shoot! League Ladders. No, for me the Umbro checker-board shirt was a purchase made out of pure admiration for the style it embodied. I wore it while playing football with my mates at the local park, and it made me feel grand. 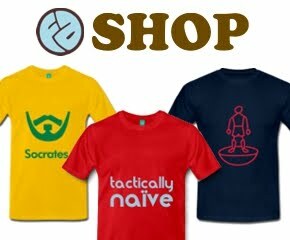 In so saying, I can think of no better tribute to this wonderful football shirt. I just punched the air when I saw this made the Top 50. Like you I wasn't a Rangers fan, but I bought this beauty! The shirt that followed this in 1990/91 was even nicer. Made by Admiral and had a swirly weave. Also the RFC logo on the back. I just had to own one.